Legen Sie diesen Artikel in den Warenkorb und Sie bekommen den Pomona-Katalog kostenfrei innerhalb Deutschland von uns zugeschickt. Pomona Electronics is a leading supplier of accessories for electronic test instruments. The company's products are recognized worldwide as being of the highest quality, dependability and reliability. Additionally, Pomona's products, designed for a wide range of test and design applications, are immediately available from stock through a strong distribution network. 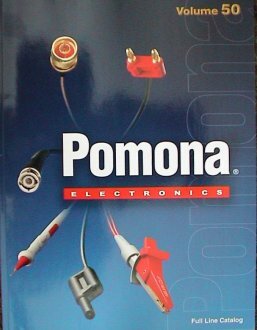 Founded by two veterans of World War II, the Pomona(r) name became respected by early TV service technicians and engineers with the development of their first product, a vacuum tube adapter, which was offered in the early 1950s. Within a fairly short time a family of easy-to-use accessories emerged to answer a variety of commonly encountered testing problems. From the beginning, quality was as important as functionality. Since then, rapid technological advances in electronics have created new testing challenges. Pomona has responded to these advances by developing innovative test accessories and by expanding its distribution network to a global scope. Through periods of very accelerated growth, Pomona has continued to maintain its high standards of quality and market responsiveness. Today, Pomona has the broadest line of test accessories in the world, for applications ranging from test labs to field service and plant maintenance. The Pomona line of test accessories is recommended by leading manufacturers of test equipment and instrumentation. In fact, these manufacturers look to Pomona as the experts in test accessory development.